In a world with an increasing asymmetrical access to freedom of movement in particular and to unequal access to labour, health care and education in general, those who find themselves in vulnerable conditions, rely on irregular services of accessing these rights. Whether for those migrants and refugees whose possibilities to claim asylum and residence have been drastically shrunk since early 1990s, or for border porters who carry heavy package of goods on their back across borders to earn an income, smuggling has been a social, political and economic endeavour that grows alongside the state and its border politics. While it is seen as a criminal, exploitative and sometimes in the words of authorities a purely evil activity, smuggling in practice is not necessarily a destructive force. Smuggling emerges from certain ways of knowing states, markets and the borders regulating them. At the same time, smuggling generates specific knowledge about these seemingly solid and permanent entities. In this sense, smuggling is a specific practice that is conducted through a series of concrete acts, strategies, techniques and planning. Consequently, smuggling might teach us about the state and its discursive and material politics of bordering. – How does a smuggler see states, borders and economy beyond the ways in which the state wishes us to see and recognise them? – What is the liminal spaces appearing between formal and informal economies in the context of smuggling? – How does smuggling rely on the vulnerability of the material and technological infrastructures by producing shadow temporary infrastructures? – What does smuggling teach us about states, borders and mobility beyond the dominant legal frameworks? Download the full program with the abstracts here. 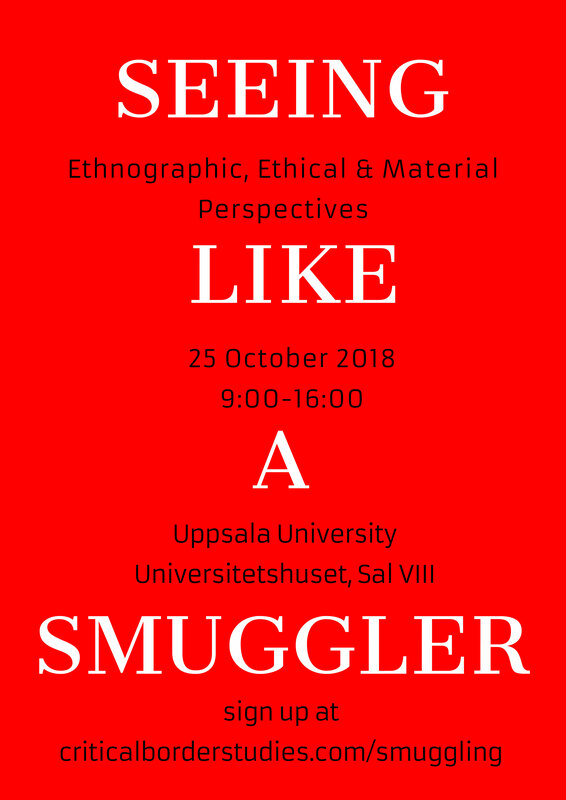 Part of Critical Border Studies, this event is co-sponsored by Engaging Vulnerability Research Programme (EV) and the Centre for Multidisciplinary Studies on Racism (CEMFOR) both at Uppsala University. The symposium is fully booked. For more information please contact mahmoud.keshavarz[at]antro.uu.se.